Miniature of the Month - from 1908! The organisers of the Best in the West tournament, which is currently being held in Melbourne, have made a brave choice in sticking with a 5 round open tournament. This is despite the event attracting 80+ players, which is well above the number of players a 5 round event could be expected to cope with. I suspect one, somewhat pleasant, reason for this is they did not expect such a large entry, and stuck with the format they had used for previous years. The general principle for swiss event is that you need at least log2N rounds to find a clear winner. Of course additional rounds above that number are desirable, to allow the minor places to be determined with some accuracy. In practice this formula does not always hold, as drawn games will reduce the number of players on perfect scores. And on the flip side, having this number of rounds will not always guarantee an outright first. The most extreme local example of this may well be the 1978 Doeberl Cup, where there was an 8 way tie for first place. The tournament was a 96 player Open, played over 7 rounds. The winning score was 5.5/7 and IM Robert Jamieson won the cup on countback. I've been stressing the importance of not missing checkmates in 1 to a couple of coaching groups I've been working with this week. The point I am (obviously) trying to make, is that once the game is over, your chances of losing fall dramatically. Of course I then saw a couple of games where the mate in 1 was overlooked! 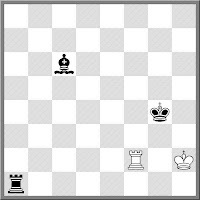 In one instance the opponent went on to win, while in the other, a draw was agreed when both players ran short of time. More sad new for Australian chess, with the passing of Max Fuller yesterday. He had been in poor health recently, and had collapsed on the morning of Peter Parr's funeral. He was taken to hospital but his condition gradually worsened and he passed away on the evening of the 27th. Max was born in Sydney in 1945, and won the Australian Junior Championship in 1963. He was a member of Australia's first Olympiad team (in 1964) and played 9 Olympiads in total. He also captained the 1986 Olympiad team. As a player he was probably Australia's first 'travelling' professional. He spent a lot of time in the UK and Europe, and finished second in the British Championship on 2 occasions. He was Australian Champion in 1972, and won 3 Australian Open's in the 1970's. He finished 1st in the Doeberl Cup 7 times, winning 3 on tie-break. Towards the end of his playing career he finished second in the 2004 NSW Championship, and tied for 1st in the 2005 Championship. As his health worsened his playing career wound down, but still attended a number of events as a spectator. Twice in the last week I've picked up points using the Greek Gift. I know this shouldn't be anything special, but I though the fact that it happened twice in 6 days is something to note. 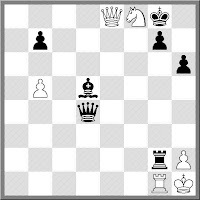 Here is the first of the games, in which I played Black. The other game was played this evening, and it finished a lot quicker, with a mate after 11 moves (as White). First interesting fact: China has an 'International Beer City'. Second interesting fact: They hold chess tournaments. There was a chess event at the Qingdao International Beer City in China, played under some interesting rules. Before each game, each player had to drink a litre of beer. Every 10 moves of the game, a mug of beer was also drunk. And if you broke any rules, you had to drink a beer. The aim of the event was to find the 'Drunken Champion' of chess. Apparently there were 100 entrants, resulting in a selection process to whittle the field down to 16 players. The eventual winner (who was not named) possessed both 'wisdom and drinking capacity'. A couple of weeks ago I (re-)found paper.li, which is a website that offers you the ability to create your own newspaper. Of course in the 21st century, such papers exist online, rather than in print form, but it is still a way of creating 'new' media. The mechanics are fairly simple, in that you choose a number of new sources and feeds based on you favourite topic and 'hey presto', you have your paper. Mine is title 'Chessinthenet' (for want of a better name) and currently has a subscription count of 1. In fact I don't mind this as its main purpose is to allow me to quickly find potential topics for this blog. The other reason this isn't a problem is that there are other 'chess newspapers' on the site (for example Chessvibes has one). In looking at my 'competitors' I realised another interesting thing about 21st century media. There are only a few new sources that 'create' news, while the rest simply just serve up other peoples news. So the news items on the Chessvibes paper looked pretty much the same as mine! From today's Street Chess action comes the following position. Black's last move was Kg5-g4 and after about 20 seconds thought White resigned. Of course the gathered kibitzers instantly suggested Rf1 as White's saving move (Rxf1 being stalemate). But the question is: Can you force mate with Black (after Rf1 by White) and do so in under 20 seconds (which is the approximate amount of time Black had left on the clock)? As I'm feeling slightly under the weather I decided to test the theory that you get more work done early in the morning, rather than late at night. So I went to bed earlier than usual last night, quickly falling asleep courtesy of the English cricket teams 'solid' batting performance. Unfortunately the second part of the experiment failed to take place, as I woke up at the usual time, rather than any earlier. So the net result is: One missed blog post from yesterday, no real work done so far (except for this message). While I previously spent a lot of my time writing software for robots, these days I've ended up as a web developer/site manager. I don't mind the change of pace, especially as there is less chance of getting killed if you make a mistake while coding. You can look at the finished product here, and browse the code at the same time. Getting a new tournament up and running is always a challenge, even more so if you hope to attract players from overseas. So the organisers of the 2013 New Caledonia have every right to be pleased with themselves, with a field of 40 players taking part. While the majority of the players are local, there are a few Australian and New Zealand players who made the trip. IA Gary Bekker, Leon Kempen and Mark Vukac are flying the Australian flag, while FM Bob Smith and WFM Viv Smith are representing the Kiwi's. Equally impressive for a new event is the top two seeds are GM's, in the shape of Sebastien Maze (FRA) and Vasily Papin (RUS). It is hardly a shock that these two players currently lead the tournament with 4/4, and will play in tomorrows round. Hopefully the success of this event will encourage the organisers to hold it on an annual basis, as travel to New Caledonia is pretty cheap, and a week of chess in the sunny South Pacific is just the tonic for the winter blues. The following game from the final round of the 2013 Oceania Zonal is an example of the dictum "you only get one move in a row". It was played between IM Vladimir Feldman (AUS), and FM Stuart Fancy (PNG). At first it looks like one-way traffic, with Feldman taking advantage of Fancy's provocative, but unsound opening play. But on move 18 Feldman eyes off the f7 square with Qf3, but this is the beginning of the end. Before he gets a chance to play Qxf7 Fancy gets in Bxd4+. And if 18.Qf3 was poor, 19.Be3 is even worse. Fancy pounces with Qxb2!. f7 is still going to fall with check, but the mate threat on h2 is so strong that Feldman ends up in a lost position no matter what he does. Originally I was going to avoid this story, but recent developments have suddenly made it more palatable. It started with a claim by Stuart Wheeler, Treasurer of the UKIP party, that 'women are failing to progress in the boardroom because they are 'absolutely nowhere' when it comes to competitive sports such as chess.' A number of people have subsequently pointed out the flaws in this argument, both on the grounds of accuracy (regarding the number of successful female players), and that the conclusion is essentially nonsense. It now seems that Mr Wheeler might have to put his boardroom seats on the table after being challenged by Rachel Reeves, a member of the UK Parliament, as well as being a former UK U/14 Girls Champion. The challenge went out yesterday, but I am not aware that it has been accepted as yet. I'm also not sure what the stakes for the match are, but I would suggest that seats on boards of Mr Wheeler's various companies would be a good start. 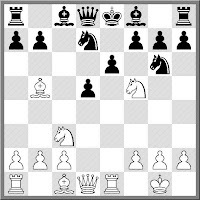 Having decided to give the Grunfeld a miss for the near future, I need to find an alternative defence the 1.d4. One correspondent has suggested I take up the Stonewall, but I'll need to do some more research before I take that option. Instead I'm falling back on my most recent No.2 opening, the Semi-Slav. I played it for part of the 2008 Olympiad (with somewhat mixed results), but at least the games haven't been that one sided. It's most recent outing was at Street Chess last Saturday. I usually play as the 'house man' (ie only play to help avoid a bye), so my opponents can often be quite random. In this case I was up against William Booth, who out rates me a few points, and our games are usually quite tactical. This game was no exception as for most of it I seemed to be facing certain death. But I managed to hang in long enough to launch a counter attack. However by the time I got going I had under 60 seconds (it was G/15m), and lost on time while attempting to eliminate his remaining pawns! From the late Martin Gardner comes the following maths/chess problem. A chessboard has squares that are 5cm on each side. What is the radius of the largest circle that can be drawn on the board in such a way that the circle's circumference is entirely on black squares? Of late my results with the Grunfeld have been appalling, and what I am seeing elsewhere does not fill me with hope. The latest anti-Grunfeld line to become popular is a simple h4-h5 hack, as early as move 5. It has been played by Morozevich and Grischuk, and at this stage the results are running in Whites favour. So my line of thinking is basically "If I let White hack me this early in an opening where I should by rights be attacking rather than defending, then what good is it?" Here is the most recent example of the h4 line, played in the current FIDE World Cup. It is, of course, a win for white. Apparently chess is under threat from under utilised rugby players. At least that is what this advertisement would have us believe. Of course the first thing I noticed was that they were playing on one of the smallest boards I have seen (at least on television), and secondly 'King capture. Really?'. Peter Parr, former editor of Chess in Australia, and proprietor of Chess Discount Sales, has passed away. He was born into a chess family, the son of Frank Parr and brother of David (both deceased), and spent his early years in England. He moved to Australia in 1968 and worked for a while with P&O Cruises, before setting up Chess Discount Sales. Although he was a reasonably strong player (having played in the Australian Championship a number of times), it was as an arbiter that he was probably best known. He was Chief Arbiter at the Doeberl Cup 21 times, and directed a number of other important events. He was the editor and publisher of Chess in Australia from 1983 until 1998, and wrote a weekly chess column for the Sydney Morning Herald. He won the Purdy Medal for chess journalism in 1987 and was awarded to Order of Australia Medal for services to chess in 1997. He also served on a number of FIDE Committees, including those dealing with computer chess, and chess rules. I'm seeing some strange parallels between the coverage of the Australia v England cricket match, and the Chess World Cup from Norway. Obviously the speed of both matches is pretty much the same (around 6 hours of play), and both have lots of slow sections punctuated with moments of high excitement. But the real parallel seems to be the trend to rely upon viewer input to 'pad out' the news. Twitter has become the 'go to' method of communicating between viewer and commentator. A lot of the cricket coverage (mainly during the breaks in play) is given over to answering viewer tweets. And when I turned on the chess coverage from Norway, the first thing I saw a viewer tweet on screen, with the commentators discussing it. To be fair to both events, viewer involvement is probably a plus, as long as it in small doses. So long as it adds to the commentary, rather than dominates or controls it, which I fear is where commercial "news" may sadly be headed. The 2013 Malaysian Chess Festival is underway, and as usual a large contingent of Australian and New Zealand players are taking part. The big event is the Malaysian Open whihc has 12 GM's among the 117 player field. After 3 rounds Max Illingworth is the best placed Australian player, sharing the lead with 3/3. There is an Amateurs section as well, with Jamie Lee Guo half a point of first with 2.5/3. Finally, a small seniors event is also being held, with FM Brian Jones and CM Paul Spiller (NZ) sitting mid field on 1.5/3. Tournament coverage is a little spotty, but you can get some information from the tournament blog. If you want to see up to date standings the follow the tournament links from this chess-results.com page. Some times the best designs are based on the simplest of things. For example I quite like the paintings of Piet Mondrian even though the form seems so obvious. The trick is to be the first person to think of the design. Designer Jim Sutherland has taken a look at a normal chess board, and decided to come up with something different. While his boards still have 32 light squares and 32 dark squares, he has arranged them in a number of different ways. One design is a spiral of all black and all white squares, while others include larger chunks of white or black squares to make differing patterns. He has a page showing some of his designs and has even built a couple of chess boards. I wonder if such designs may also allow a set of chess variants based on the colour of squares pieces can move to (ie bishops move diagonally, but must land on a square of the same colour they started on). If you visit his page you can also follow a link to another interesting chess design, the Typographic Chess Set. Washington Square in New York City has been a famous outdoor chess venue for a number of years. I probably first heard of it via "Searching for Bobby Fischer" but its history goes back many years before that. But apparently it has lost its lustre, with players moving to another square, Union Square. It appears economics is the main explanation for the shift, with a larger amount of passing traffic meaning more "customers" for the chess pro's (apparently the term "hustler" is frowned upon). The proximity to the Subway station is also cited as another reason. There is also the issue of social factors (increased drug use) resulting in Washington Square being a less popular hang out for New Yorker's. The Villager has quite a big write up on the issue, including a nice collection of pictures, which help give a feel for the New York "street chess" scene. Only 2 days to go before the start of the 2013 FIDE World Cup. Apart from the $100,000 first prize, two places in the next Candidates series are also on offer. The combination of the two rewards may account for what seems to be a very strong field in this years events. Almost all the top players in the world are taking part, with the obvious exception of Anand and Carlsen. Lev Aronian is the top seed, with Caruana seeded second and Kramnik third. Oceania representative Igor Bjelobrk as quite a tough opening opponent, in the shape of 4th seed Alexander Grischuk. The official website for the tournament is here, and will be offering both live games, and live commentary. The diagrammed position occurred on a board near mine during this evenings play at the ANU Chess Club. At first glance it looks as though White is in trouble, as mate in is threatened. But it was Whites move, and he has a discovered check (Ne6+) that appears to win the queen. But this is what Black was counting on, as after Kh7 Nxd4, White still gets mated after Rf2+. White did in fact play Ne6+ but after Kh7 had a long think, before simply offering a draw to his opponent. Rather than quibble about the rights and wrongs of the draw offer (technically White should have moved first), Black accepted it with a grin. Of course White does not have to take the queen, and Nf8+ leads to a repetition. Over the weekend German IM Jens Kotainy was disqualified from the Sparkassen Open (Dortmund), for having a communication device on his person during the game. During his games he was observed putting his hand in the pocket where the phone was located after each move, leading to suspicions he was receiving computer assistance. After the game the phone was inspected, and after it made a buzzing noise the arbiters decided to exclude him from the tournament, as well as award a win to each of his opponent she had already played. As a member of the recently formed FIDE/ACP Anti-Cheating Committee, I was already aware of some of the previous claims against Kotainy. There had been some disquiet about his participation in other events, but the organisers allowed him to play, as there had been no definite proof he had been using a computer. However a combination of physical evidence, supported by statistical analysis of the games he played during the tournament, gave the organisers reasonable grounds to suspect that something was going on. What happens to Kotainy now is still being decided. After an earlier case (the Bindrich Case) the German Chess Federation has tightened up its regulations to deal with such incidents. There is also the possibility that FIDE could also take action via the Ethics Commission. For anyone interested in looking at the statistical side of things, I suggest you look at the work that Ken Regan (a fellow member of the committee) has done in this area. As I mentioned in this previous post, the numbers are less about the number of times a players move matches a computers and more about the likelihood that such a players moves and a computer engines moves would agree. Having scanned through my files of games looking for a suitable 'Miniature of the Month" entry for June 2013, I settled on the following game from France. Played between two highly rated players it had the added benefit of starting with a slightly off-beat opening, in this case the Fritz-Ulvstead variation of the Two Knights. But while having a quick play through it looked a little familiar. I'd played a Two Knights online thematic a few years back, and the players looked as though they were following an old main line. It turned out that not only were they following old theory, they were also following an old game. Apart from Black's last move, the whole thing had been played between Leonhardt and Englund in 1908. The only difference was with the move that caused White to resign. In the earlier game Black played 18. ... Ke7 instead of 18. 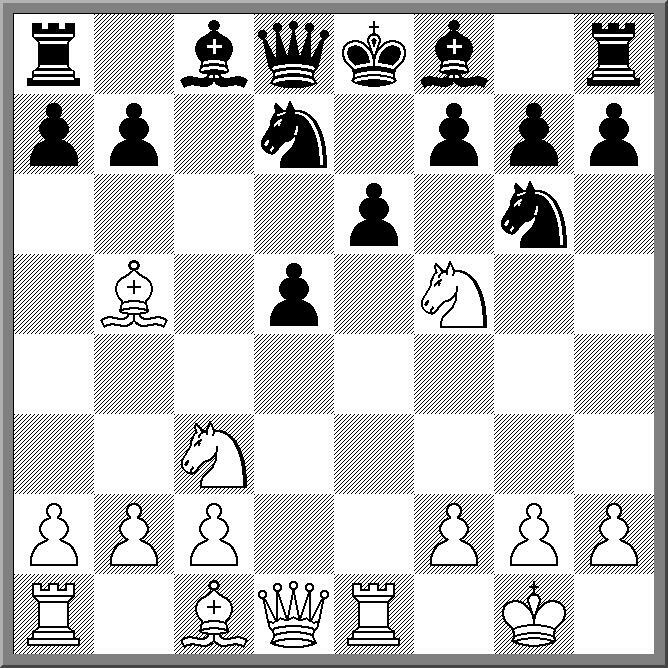 ... Kd7 but in either case the threat of Rxh2 followed by Rh8 is enough to win. Vladimir Kramnik has had a reputation for being a safety first player, at least in the latter part of his career. He has even been nicknamed 'Drawnik' in some quarters, although I do wonder what his drawing percentage is compared to his contemporaries. But like the famous scorpion in the tale told by Boris Spassky, there are times when Kramnik has to sting. His game against Daniel Fridman in the current Dortmund Classic is such a game. After a slow double-fianchetto opening, Kramnik opens the f file with a pawn sacrifice, followed by an immediate exchange sac. After that his pieces just climb into Fridmans position, and within 10 moves Fridman is lost. While fishing around the internet for something interesting to post tonight I stumbled onto a list of Grandmasters at .... Stratego! I assume that these titles are handed out by the organisers of the Mind Sports Olympiad, but I do not know what the qualification system is. Apart from the GM title, there are also IM's and even CM's. Of course there are not FM's (as the F belongs to FIDE) but maybe they could consider MM's as a future title. BTW these titles are not limited to Stratego, but can also be earned for Twixt, Abalone and a number of other games (Listed here). If you think you are already a master at some these games, and only need a title to confirm it, then you might want to give the 2013 Mind Sports Olympiad a go. It is in London from the 16th to the 25th of August, and all the details are at this link. A question put to me by my son the other day. In a sudden death blitz playoff, would you rather have 2m+3s increment, or 3m+2s increment? I would probably choose the 3m+2s start time (as I am a pretty slow player anyway), although it may depend other conditions on offer (draw odds etc). If you do add draw odds to the equation (for a necessary 1 off game), then this may become a variant on some game based bidding systems I've seen. The USCF experimented with such a system last year, where players nominated an amount of time on the clock to start with, with the lowest bid "winning". That player then started with that time, but received draw odds (and the black pieces). The other player started with the full amount (eg G/30m v G/23m). Similar ideas have also been used in war/board games, where a players nominate the number of Victory Points needed to win the game, but the successful bidder (high bid), gets to choose the side to play. And just to wander slightly further a field, in some simpler boardgames (eg Hex), there is a system where player A gets to move first, but player B can then decide to 'take' player A's move (ie become A while the old A then plays another move as B). This deals with the situation where the player moving first has an overwhelming advantage, encouraging the first player to choose a more neutral opening move!